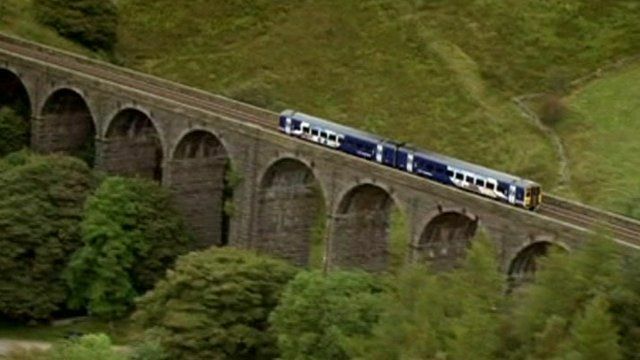 Saving the Settle-Carlisle line Jump to media player Thirty years ago, the picturesque Victorian main line from Settle, North Yorkshire, to Carlisle was destined for closure but campaigners had other ideas. On board a real-life 'ghost train' Jump to media player "Parliamentary" trains are strange services which often run just once a week and in one direction. Video released of escalator falls Jump to media player Footage of people falling down escalators at railway stations is released as part of a campaign to cut the number of accidents. 'Safety' trains to tackle rail crime Jump to media player Video footage of people trespassing on railway lines has been released as "safety" trains are introduced in the East Midlands to tackle crime on the rail network. Back on track: Last and first trains Jump to media player A look at some of the first and last trains to use the track through Dawlish before and after the collapse. It may be one of the most picturesque railway lines in England, but 30 years ago the old Victorian main line from Settle, in North Yorkshire, to Carlisle was destined for closure. Campaigners fought hard to save it - and succeeded, against the odds, as BBC Breakfast's Jenny Hill reports.